Due to the emergence of advanced diagnostic and imaging technology for the operating room (OR), operating spaces are becoming increasingly congested and complex with a multitude of OR devices and monitors. As a result, ORs are becoming more ergonomically designed and purposefully built with systems that increase efficiency in order to reduce procedure time and improve surgery success rates. These ORs, known as integrated and hybrid ORs, utilize the most advanced video systems, digital image capture devices, integration hubs/routers/racks, and other capital equipment used in the medical industry. Massive growth in OR equipment is driving the excitement of upgrading to 4K resolution in surgical displays and cameras. Hybrid ORs incorporate imaging technology like computed tomography (CT), magnetic resonance (MR), and C-arm X-ray systems to assist surgeons in performing quicker, more successful surgeries. By bringing imaging into or adjacent to the surgical space, patients don’t have to be moved during and between surgery, reducing risk and inconvenience. Hybrid ORs require a high investment cost, due to the integration of some of the most advanced imaging and video systems available in the medical device market. Currently, all the hype surrounds 4K devices, with a horizontal screen display resolution of approximately 4,000 pixels. In the healthcare industry, 4096 × 2160 (DCI 4K) is considered the “full 4K” resolution, although many companies still offer UHD displays, which have a resolution just slightly lower than 4K (3840 x 2160 pixels). 4K devices are expected to experience moderate to high growth in most countries around the world. 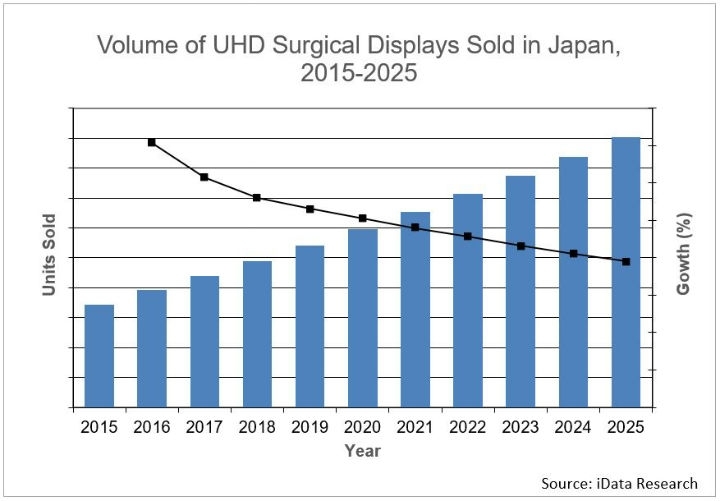 In Japan, UHD surgical displays have been available and the market has been growing for the last several years at low double-digit rates. 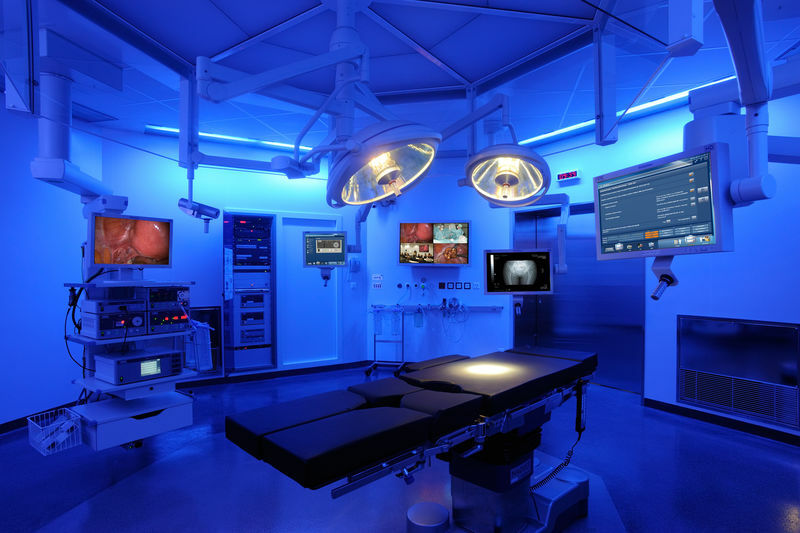 4K surgical displays are available in Japan, but not as widely used compared to UHD displays. Although a growing percentage of facilities have converted to UHD and 4K, there is still a considerable HD installed base in both Japan and China. The conversion of this installed base will continue to drive growth in the number of units sold in the market. 4K surgical cameras, on the other hand, are newer to the market and the market has been experiencing double-digit growth rates. Surgical camera systems are used primarily in minimally invasive surgeries (MIS). MIS procedures result in faster recovery time, fewer infections, and significant overall savings compared to open surgeries. For these reasons and more, hospitals are willing to invest a significantly higher amount on upgrading HD devices to a much higher quality 4K device. Over the next seven years, the market for 4K surgical cameras in Japan is expected to continue significant growth. More can be found in a series of reports published by iData Research entitled the China Market Report Suite for Video and Integrated Operating Room Equipment 2018. The China market for video and integrated operating room (OR) equipment includes integrated OR components, hybrid OR components and imaging systems, surgical camera systems, digital image capture and recording devices, surgical displays and PACS monitors, medical photo printers, surgical lighting, booms, tables, microscopes, and integrated OR management software. iData’s suite of reports on this subject cover the United States, 15 countries in Europe as well as Japan, China, and South Korea. These include a comprehensive analysis on units sold, market values, average selling prices, forecasts, as well as detailed competitive market shares and analysis of all major players. Email us at [email protected] or register online for a China Market Report Suite for Video and Integrated Operating Room Equipment 2018 brochure and synopsis.